Flying taxis could someday become a reality, but the timeline that everyone is counting on is a little ambitious. Uber recently predicted it would begin deploying its service, UberAIR, in 2023. Many experts agree that’s a bit aggressive. The public is barely adopting autonomous systems for cars. The systems that make autonomous flight possible, practical and affordable are a long way from widespread use. The required air traffic control integration that would make this service safe is barely being considered, let alone in-place, and let’s not even start on the regulatory consent needed from federal and city governments. 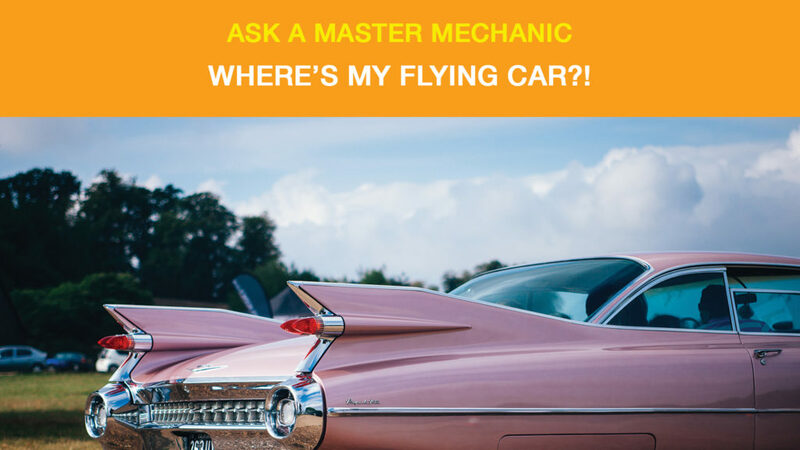 So, we asked a Master Mechanic: what are the top reasons we don’t have a flying car just yet? Although Uber has previously stated that it intends to launch UberAIR with human pilots, that is neither sustainable or profitable. They have been working on self-flying systems for some time, but they are nowhere close to ready for the public to use. That begs a bigger question: is the public ready for this technology? In the meantime, Uber might look to a system developed by NASA that enables what they call “simplified vehicle operation”. With this technology, most of the systems that manage flight and navigation are controlled by the computer. The pilot simply controls what to do and where to go. This technology is available to the public now and is how most drones operate. Uber, on the other hand, is seeking to make a safety-certified, passenger taxi version that’s operated in commercial airspace. A slightly more difficult feat, to say the least. Uber and its partners have stated many times that they believe electric is the way to go. This is mostly because electric propulsion is simpler, more reliable, and more controllable than combustion engines. Although we’re still ways off from seeing an electric propulsion commercial aircraft that can fly several hundred miles at a time, air taxis require far less power. Many aerospace and technology experts believe that short-haul flights of just 10 or 20 miles are possible even with current battery technology. Uber, however, recently announced a partnership with electric-aircraft start-up Karem, so they’re definitely looking beyond current technology. The trick for Uber will be achieving the high-speed charging needed for quick-turnaround flights. Commuters won’t want to wait for their air taxi to charge when someone else drops them off! Over time, we’ve learned to find efficiencies in almost all areas of manufacturing. Over time. Building an aircraft out of composite materials like carbon fibre is still mostly completed by-hand because manufacturers need skilled workers to eliminate the structural voids and weaknesses that might be acceptable for a land vehicle. For a flying pod full of people hovering 1,000 feet in the air, regulations need to be unusually strict. While we do have skilled workers to do the job, achieving the numbers Uber needs to scale globally is pretty difficult. Air taxis will be operating in cities that are already regulated when it comes to noise from helicopters and planes. If Uber plans to have hundreds of their air taxis take off each hour, they’ll need to be no louder than a car. They’ll also face the challenge of acoustic signature, which is how the noise produced blends in with the natural sound of the city. Since current city traffic generates most noise, as we move towards quieter electric vehicles, this may get harder to achieve. Ultra-quiet electric aircraft will require significant innovation, given that the taxis will still have to move the same amount of air through the rotors. Only time will tell if Uber and their partners can achieve this. Five years doesn’t seem like much time to overcome these hurdles. Flying cars may look like a far-off dream that requires people to not only rewire the way they think, but the way they get around–but was Uber much different a decade ago? In the meantime, if you need help keeping your non-flying car driving, contact your local Master Mechanic today to book an appointment.